Newly obtained video shows the latest crash and what happened after that crash occurred. 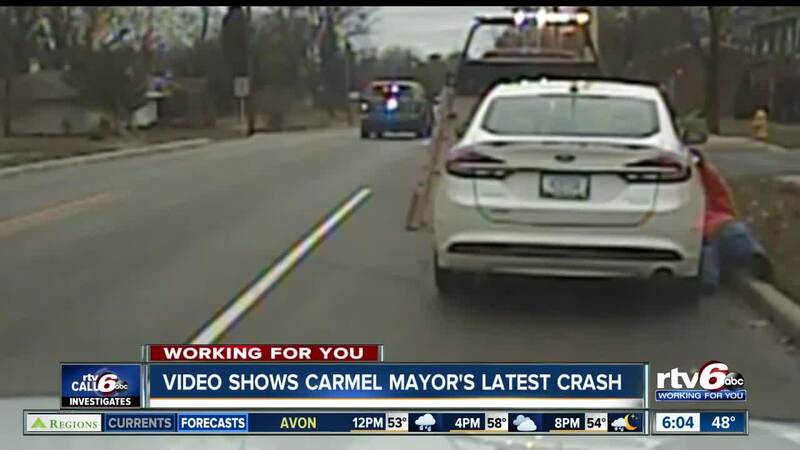 CARMEL — The mayor of Carmel has been involved in multiple crashes over the last few years, but newly obtained video shows the latest crash and what happened after that crash occurred. The crash occurred on December 15 along West Main Street near Knoll Court around 2:45 p.m., according to police reports obtained by Call 6 Investigates. This was at least the second crash Carmel Mayor James Brainard has had in a city vehicle over the past few years. Since the latest crash, Call 6 Investigates' Paris Lewbel obtained documents, photos and video of the crash from a public records request to the city. Call 6 received two clips of video from the public records request. The first, a recording from the security camera at a City of Carmel building near the roundabout at 4th Street and Main Street. The second, a recording from the dash camera inside the Carmel Police Department cruiser of the officer that completed the accident report. At the beginning of the clip from the security camera, you can see the mayor’s city-leased white Ford Fusion entering the roundabout from 4th Street SW. The car goes around the roundabout and exits onto West Main Street and you can see it pull over to the side of the road at Knoll Court. Then the mayor pulls out into traffic, colliding with another vehicle. The city says the mayor was giving a tour of the city to three movie producers that were in town and was trying to make a U-Turn when the collision occurred. You can see the vehicles pull over and according to the police report, the mayor exchanged information with the other driver, who then left the scene. The security video continues for 13 more minutes and shows the mayor and the three movie producers walking down West Main Street, away from the scene of the accident. Moments later, an unmarked police vehicle stops on the side of roundabout and talks to the mayor and then drives up to the scene of the crash. The other video obtained by Call 6 is from the dash camera on a Carmel Police Department cruiser that was called to the scene. That video starts at 3:03 p.m. The dash cam video shows the officer pulling up to the scene behind two other unmarked police cars. He then talks to the police chief and the mayor. The officer and the chief talk about the nearest location for the mayor to get an alcohol test, as required by city policy. You can see the mayor get in the police chief’s vehicle to go get that test. In the official accident report, the officer said he was contacted by the Carmel police chief to respond to the scene and complete the accident report. According to documents obtained by Call 6 Investigates, the mayor appears to have never called the 911 Center in Hamilton County to report the accident and ask police to respond. It’s unclear who the mayor called directly after the crash. The city says, employees are required to take a test if they're involved in a crash, regardless if there is evidence of drinking. But they say, the mayor is technically an elected official and not a city employee, so he is not under the same requirements.